Summary: Hana, a college student, encounters a mysterious man that turns out to be more than just a human. He is able to transform between human and wolf seemingly whenever he chooses. The two fall in love, get married, and have two children, a girl named Yuki and a boy named Ame. The four live happily tucked away in the corner of a city to conceal the existence of the “wolf children” that are not yet able to control their transformations. 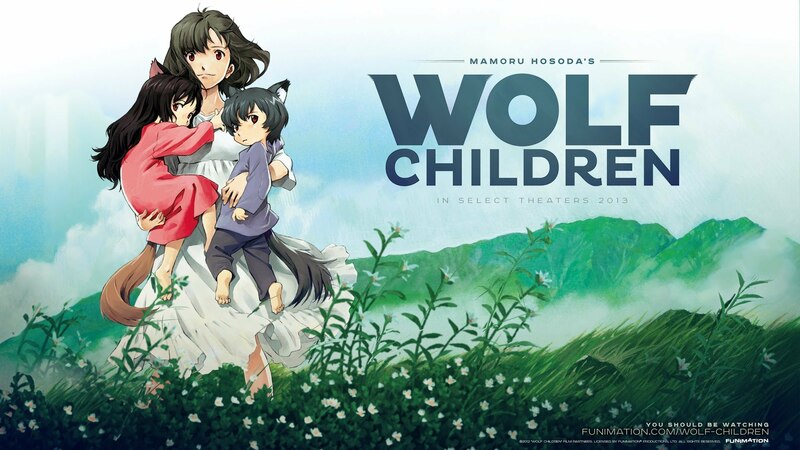 When the wolf man husband suddenly dies, Hana realizes the only solution for her to raise her children is to move to a rural countryside away from the city. Wolf Children is an emotional roller coaster. There are highs and lows, happiness and sadness, joy and despair. The animation and the soundtrack were both well-done. The story kept me interested from beginning to end. Hana is an amazing character that you will be rooting for throughout the film. She is a single mother throughout most of the film and she is determined to do whatever it takes to give her children a normal life despite them being part wolf. She has no idea how to be a wolf child’s mother, but you can tell that she is always trying her best to raise her kids. Yuki and Ame are also great characters that develop throughout the film in ways that leave me with mixed emotions. The relationships between the two children, and the children with their mother, feels very real. That ending though…I’ll leave it at that. You might enjoy this if: You want a solid film that will leave you thinking about it long after it is over. You might not like it if: You are looking for something light-hearted and fancy-free. Note to the Viewer: Get ready for a punch in the mouth with emotions. This entry was posted in Anime and tagged 2012, ame, anime, children, drama, fantasy, fragglepuss, hana, june, life, no, ookami, review, slice, to, wolf, yuki. Bookmark the permalink.